We love fun, themed centers for each season. So, with fall in the air, these apple ten frame puzzles were a great addition to a math workshop bin or for independent play! 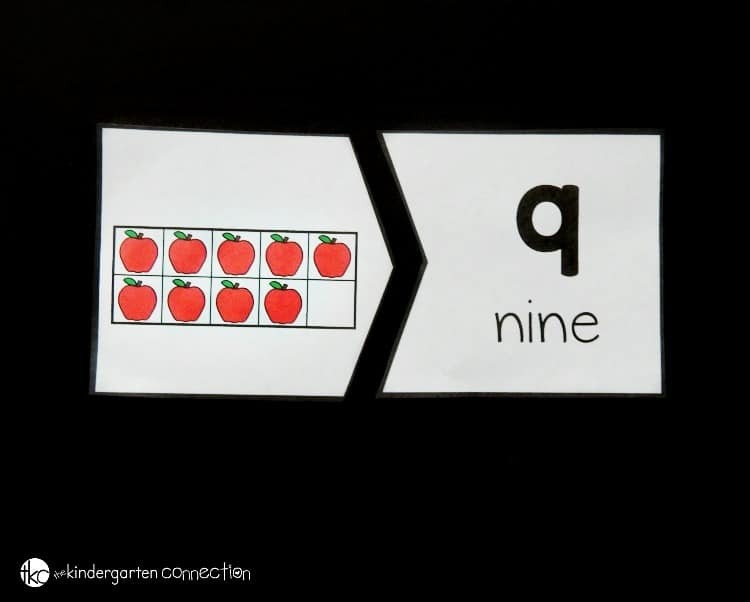 Plus, since these are self-correcting puzzles, they are great for any Pre-K or Kindergarten student working on building up their counting and number recognition skills to ten while promoting independence too. I printed out a few sets of these cards so that we could have a few kids use them at once, and so that I could have some sets for small groups. I laminated them, and then cut them apart on the solid, dividing lines. You will notice that on these puzzles, the lines are all different shapes. This means that the kids can check their work themselves because the puzzles will not fit together unless they are correct. This is great for students who are just being exposed to ten frames and counting and need that extra confidence boost. What I also love about these puzzles is that they not only have the numbers on them, but the number words as well. In Kindergarten we will be learning to read number words, so this gives them that extra bit of exposure to them. 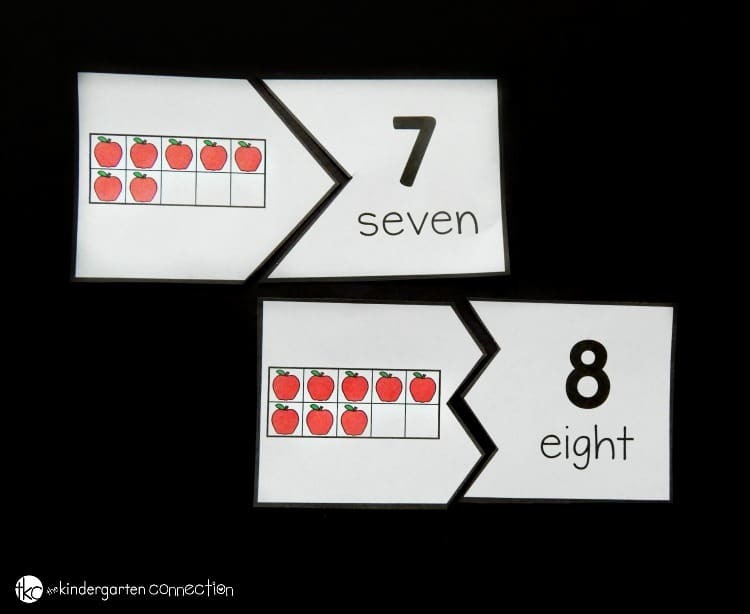 They count up the apples in the ten frames one by one (you may even notice some students begin to subitize the ten frames, or recognize the quantity instantly without counting) and then pair them up with their matching total! 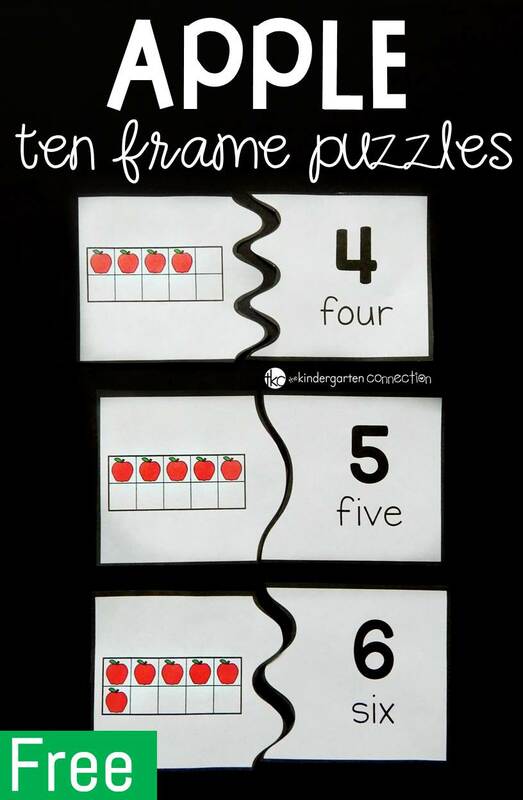 After they have finished with the ten frames, they can mix them up to try again or, if they seem ready for a teen number challenge, they can give our apple 20 frame puzzles a go! Then, for tons of ready to print and play apple fun, hop over and grab our Apple Math and Literacy Centers! Thank you for sharing. These are great and will work perfect in a math tub! Thank you so much for sharing your amazing resources! As a new teacher, I appreciate your help in preparing for the upcoming year! I LOVE your materials!!!!! Hi Lauri! This makes us so happy to hear! Good luck on your school year and have fun!